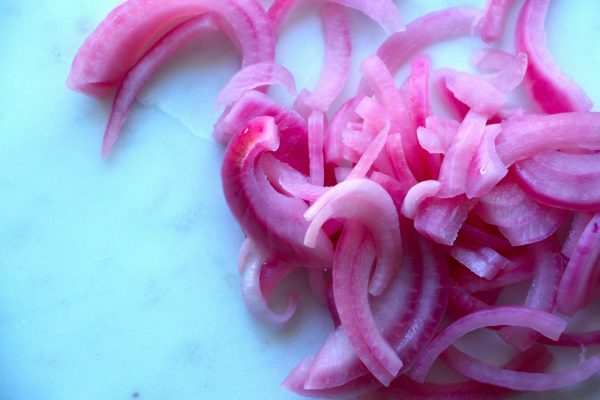 Paleo Pickled Onions | Courtney the Cook | Super easy, y'all! Slice onions. I like to halve the onion from top to bottom, place the flat side down and slice thinly so you have half-moon slices. You can also dice the onions if you prefer. Pack the onions into the jar. Using a liquid measuring cup, add the ACV, water, lemon juice, and salt and stir. Pour the mixture over the onions until all are covered. I usually pack the jar right up to the top. Shake the jar to make sure all onions are covered. Turn the jar upside down and leave on the kitchen counter overnight (at least 8 hours). In the morning, turn the jar upright and place in the refrigerator until ready to use. Which should be immediately because they're so good!!! I can’t get enough of the color! They’re beautiful and they elevate every dish they join. Make these ASAP and comment below with what your favorite dish is you put them on. I can’t wait until tomorrow when I get to eat more! !